Lemon Cucumber aka Dosakaya is a cherished vegetable in Andhra cuisine. 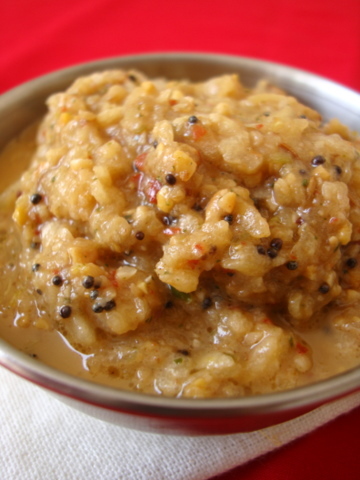 Pachadi (Chutney), Pappu (Dal) and Avakai (Pickle) are the common preparations. I have blogged a pickle recipe as well as a pappu recipe using Dosakaya. Armed with firm, farm fresh Dosakaya, we prepared a tangy spicy pachadi that makes for a memorable side with rice and a dollop of ghee. 1 Heat oil in a pan, add bengal gram and split gram dal and cumin seeds and saute for 4 mts on low-medium heat or till they turn golden brown. Add curry leaves, green chillis and red chillis and fry for another mt. Remove from pan and cool. 2 First grind the spices to a coarse powder. Add tamarind paste and blend once more. Add the dosakaya pieces and salt and grind to a coarse paste. The cucumber should not be made into a paste. A stone mortar is recommended to crush them but you can use a blender too. 3 Heat oil in a small pan, add the mustard seeds and let them pop. Add the split black gram and let it turn red. Add the curry leaves and hing and toss them for a few seconds till the flavors come out. 4 Turn off heat and add the seasoning to the ground dosakaya pachadi and combine. Serve with hot steamed rice and ghee. Tasty and tangy Andhra treat! I suppose Dossakai is that big round cucumber. My mother in law often makes it, but its new to me. Nice to try. This dosakaya is unique to Andhra. We do not get it in TN. My mom-in-law prepares a yummy pachadi but the preparation is different that yours. Your preparation looks delicious too. The chutney looks yummy..I am from north India and most of the ingredients are difficult for me to comprehend..like minapa pappu, senaga pappu..also what is lemon cucumber called in hindi? This is something different..looks incredibly delicious! Mmmm! There is nothing better than yummy dosakai pachadi with rice and nei… I now have such a strong craving for this! Wow !!! I love this pachadi, had it once or twice. Always wanted to know how to make this, will try it out for sure, thanks a ton for the recipe Sailu. There is no need to cook the dosakaya, Aruna. Its used raw here. Either peeled or unpeeled. I have peeled the lemon cucumber for this recipe. Thanks for posting Dosakaya Pachachadi. I have some questions unanswered after going through the recipe. However, whether to take out the skin from the dosakaya is not very clear. Also whether the Dosakaya need to be cooked or fried in the pan? Please let the readers know bit more details which would benefit readers like me more. I would appreciate your clarification. Thanks for dosakaya pachadi receipe. Nenu chala rojulu nundi ee receipe kosam choostunnanu. Once again thanks. nenu try chesanu chala baga vachindhi. almost mee receipes anni try chesanu. anni baga kudarayyi. keep on posting traditional receipes. You come up with different and wonderful recipes. Good job. I tried this recipe, it came out well. Thanks for sharing a good one.Appreciate it. I hear only cucumber.Is lemon cucumber is different….?? ?